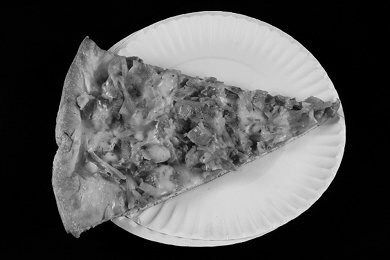 Back to the black and white photo for a discussion about pizza. Why did I choose black and white? I don't want you to fall in love with how delicious it looks AND I want you to think about pizza differently. Pizza does look strange in black and white doesn't it? Back in the prehistoric period, there was pizza that had cheese, sauce, and an assortment of toppings such as pepperoni, mushrooms, and anchovies. Now, you can find pizza with the craziest ingredients. This slice was purchased at my town's famous pizzeria, Antonio's Pizza. I asked the poor slave working behind the counter which slice was the most popular. Guess what he said? And this is a slice of chicken, bacon, ranch pizza and I am just blown away by how Antonio's and Domino's managed to make pizza into a seriously unhealthy choice. Ranch dressing on a pizza? ouch. One slice of regular cheese pizza (1/8th of a 14 inch pie) with a thin crust is 230 calories - chicken, bacon, ranch? 330 calories! Eating TWO slices of chicken, bacon, ranch is like eating THREE regular slices. Pizza doesn't have to be like this. We don't need Philly Cheese Steak pizza or Bacon Cheeseburger Pizza, or the incredibly unfathomable "MeatZZa Feast" pizza with an extra layer of cheese on top of the pepperoni, ham, sausage, and beef. No, you can buck the trend and add VEGGIES to pizza and have a perfectly reasonable lunch or dinner. There is nothing wrong with pizza and vegetables. Yes, there is CHEESE and CRUST, but you can get spinach, mushrooms, onions, green peppers, pineapple, olives, and tomatoes added to your pizza. YUM! What does everybody need to know about pizza? Please share your thoughts on unhealthy pizza. Thanks Snack Girl! Love your posts. And you are so right about pizza. I would add it tastes just as good with 1/2 the cheese they usually put. Have to get specific with the Pizza man. One time I requested 1/2 the cheese and they put full cheese on 1/2 the pizza and none on the other! But isn't this just like so many other fast food inventions? It's hard to have a day go by that we don't see some new way that the fast food industry has added calories either by some wild combination of bad-for-you foods or by increasing portion size. I suggest a post on some of these kinds of things, which it seems pretty much every fast food restaurant (and such chains as TGIF and the like) have come up with in recent years. It's like fast food on steroids! For me, I order my pizza with lots of veggies and ask to go light on the cheese! Or if I'm in a cheesy mood I get a Margarita Pizza. I love pizza so much, why can't the crust be healthier? I hear you- Antonios is not a very healthy pizza place. BUT I don't think they pretend to be or aspire to be, and I think their target market is the 1 a.m. crowd when the bars let out and Antonios becomes "club sidewalk" for drunken college kids getting "hot cheese up front". I have many fond memories of Antonios (buffalo chicken was always my fav) but I would not be likely to stop there if I visited Amherst at this point in my life. Some places will make a "cheese free" pizza, which can actually be quite tasty. Home Slice in Austin, TX makes GREAT pizza, including those w/just veggies and no cheese. I've been following your blog for a long time and I love reading everything you post. :) Today's post reminded me of something I read in our local newspaper. I think the problem in our dietary choices is not ignorance. Most people can look at a pizza loaded with chicken, bacon and ranch dressing (and cheese!!) is bad for you. Something that sounds that good can't possibly be good for your health. Unfortunately, many people, even knowing that it's bad for your health, will eat it anyway because it tastes good. Not to say that traditional pizza with tomato sauce, vegetable and even a little pepperoni isn't good. But chicken, bacon and ranch is just better. I think there's something to be said about making your own version of "bad pizzas". I think if you make it at home with multi-grain crust, go light on the cheese, ranch dressing and bacon, but with lots of veggies, you can still have this unhealthy version of pizza without feeling too guilty. And let's be honest too, ranch dressing and bacon both are highly flavourful. So you won't need a lot of it anyway. The pizza would still be a treat without clogging an artery along the way. One funny thing about me is that I can't STAND chicken on pizza. I'm kind of a traditionalist. Give me sausage or pepperoni and load up on the veggies! My husband is all about the meat and less or no veggies. Honestly, I'm more concerned about the amount of sodium in pizza than anything else. I'm resorting to making pizza at home with homemade sauces on low carb flatbread. I have always been a cheese only, regular crust, no toppings, pizza gal. Some of these new pizzas are insane. I can't remember the last time I went out for pizza or ordered one (actually, I can - there's an incredible pizza truck in DC called Pi Pizza and I'm crazy about their cornmeal crust, but that was more than a year ago). Maybe once or twice a month I make a pizza at home and split it with a friend or my boyfriend - Trader Joe's has the most amazing whole wheat pizza dough that I top with their pizza sauce and fresh mozz. I'm going to try making my own mozzarella in the next few weeks and perhaps my own sauce too, but that dough is just so yummy. Antonio's is definitely novelty pizza. They make one that has tortellini on it, too, which always seemed a little carb-extreme to me. I think that most of the students who frequent Antonio's aren't thinking about the fat and calorie content of their chicken, bacon, ranch pizza. I'll admit that I didn't when I was at UMass. I rarely eat pizza, so I don't feel too bad indulging in it now and then. Usually I get veggies and one meat. Ranch dressing on a pizza sounds weird to me though! Just last night I tried making a pizza with pita bread. That would be my suggestion for a future post for Snack Girl. It came out pretty good, except the pita came out a little too crunchy, but I'd try it again. I love pizza. Nowadays I usually get the frozen Red Baron cheese pizza because that's all my daughter will eat (the cheese part, Red Baron because it's the least expensive). I add some veggies to one side so I can eat it too. I know it's not that great, but it's still pizza. :) Someday I'll make my own pizza, even if it means buying the premade dough at the grocery store to start out until I'm brave enough to make my own. The best and worst pizza I ever had was an Enzo - thin crust but then Italian bacon-like ham on a tomato sause and cheese base, doused with globs of heavy cream with a raw egg broken in its middle! Yumm, but oh dear those points. Must be in the thousands. I have to admit that pizza is my downfall. I love pizza! I did decide a few years ago though that if I am going to eat it I will only get it from a real pizza place - no Little Ceasers, Dominoes etc for me. I am actually glad when my kids want to order from Dominoes cause I know I wont eat it! My only complaint about a lot of veggies on pizza is that they make the crust soggy. Those veggies that have a high water content (green pepper, tomatoes, spinach) turn the crust to mush. I always ask for light on the cheese. It helps reduce fat.